PIH's Smoke-Free Public Housing Rule was finalized on December 5, 2016, and became effective February 3, 2017. All PHAs must comply with the rule and implement smoke-free policies within 18 months of the effective date, no later than July 31, 2018. The elimination of second hand smoke that can migrate between public housing units can be an important step towards improving the health of residents as well as reducing maintenance costs for PHAs. Due to the known risk of exposure to second hand smoke, increased risk of fire, and increased maintenance, smoking is prohibited in any indoor area of the property, private and common, of select high rise apartment developments. The term "smoking" includes inhaling, exhaling and burning or lighting of any tobacco substance, unregulated nicotine product, or herbal matter, in any form. This Policy applies to all employees, residents, guests, contractors, business invitees and service persons. Tenant agrees and acknowledges that the premises to be occupied by Tenant (indoors), and all common areas of selected high rise apartment developments have been designated as non-smoking. There are designated Smoking Areas outside the building(s) where residents and guests are expected to smoke. Not everywhere outside the building is a smoking area. 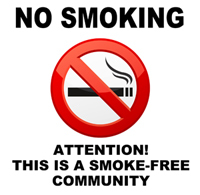 Tenant shall inform tenant's guests, invitees, visitors and business invitees of the No-Smoking Policy. Owner shall post "NO SMOKING" signs at entrances, exits, common areas, and hallways. Tenant acknowledges this NO-Smoking Policy does not make the Owner or any of its management agents the guarantor of tenant's health or of a smoke-free unit, building or development. However, Owner shall take reasonable steps to enforce the no-smoking terms of its lease. Owner is responsible to take action against individual(s) violating this policy if and when the Owner is notified of the violation. Owner is not required to witness the violation first-hand to take action against an individual. Owner specifically disclaims any implied or express warranties that the building, common areas or tenant's premises will have any higher or improved air quality standards than any other rental property. Owner cannot and does not warrant or promise that the rental premises or common areas will be free from second-hand smoke. Tenant acknowledges that Owner's ability to police, monitor, or enforce compliance with this Policy is dependent in significant part on voluntary compliance by tenant and tenant's guests and other occupants of the development. Tenants with respiratory ailments, allergies, or any other physical, mental, emotional, or psychological conditions relating to smoke are put on notice that landlord does not assume any higher duty or care to enforce this Policy than any other landlord obligation under the lease. ACHA Residential PropertyManager (RPM) meets with the resident in his/her unit to provide a copy of Smoke Free Policy The RPM has the option to give a general reminder to the building or sites. Written notice will be given documenting the date(s) the RPM met with the resident and the meeting outcomes. A private meeting is held with resident in the Management Office and a "last chance" agreement is signed by resident agreeing to abide by the ACHA Smoke-Free Policy. All previous meetings are documented in the agreement. Resident is served a Lease Termination Notice for continuously violating the Smoke-Free Policy and eviction procedures are initiated. PLEASE NOTE: All Reasonable Accommodation requests related to the Smoke-Free Policy will be reviewed by a committee directed by the 504 Coordinator. Managers should not make RA determinations related to the Smoke-Free Policy.